With his masterful use of oils, artist Morgan Weistling brings a scene to life and engages our imagination and emotion. "Patterns and shapes, arranged in a pleasing design, are the basis for Dreams in Gold," says Weistling. "I love taking a simple story of a girl who has fallen asleep after reading in bed, and breaking it down to an abstract design. Painting her from above, everything looked new to me. Shapes flattened out and felt dreamlike and floating. This perspective suspended her in a state of weightlessness. 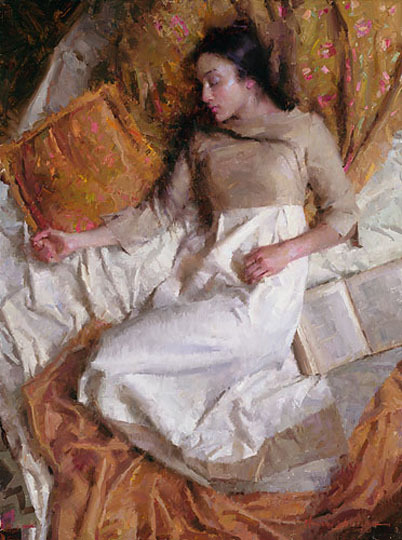 Surrounding her in yellows and warm gold colors added to the peacefulness of her mood."